We all know that Paul Ryan is conservative on fiscal issues. He’s the man with a plan to stop overspending and solve the debt problem. But where does he stand on other issues? Here’s an article from the liberal Washington Post about Ryan’s foreign policy views. 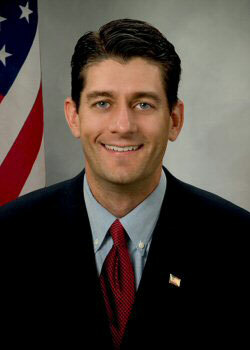 Rep. Paul Ryan (R-Wis.) gave a speech Thursday to the Alexander Hamilton Society in Washington. If one is looking for clues as to Ryan’s interests beyond chairing the House Budget Committee, a speech, as he put it, to “a room full of national security experts about American foreign policy” would merit attention. Ryan contends that the debt crisis is not a bookkeeping problem or even simply a domestic problem; it is about maintaining our status as a superpower and about American values. And finally on defense spending, he rejects the sort of penny-pinching isolationism of Jon Huntsman or Rep. Ron Paul (R-Tex.). I agree with him on all of that. But how is he on social issues? Ryan, the top Republican on the Budget Committee who has a strongly pro-life record, talked about the place social issues have in the election in an interview with CNBC last week. Ryan also released a statement today that LifeNews.com received saying pro-life issues are not on a list of menu items that have to be given up during the election season. Conor Sweeney, a top Ryan spokesman, told LifeNews.com today that Ryan doesn’t agree with the “truce” on social issues Barbour and Daniels have advocated. He also pointed to comments Ryan made in a Weekly Standard interview rejecting the “truce” language and putting him outside the Daniels-Barbour circle. YES on banning gay adoptions in DC. NO on funding for alternative sentencing instead of more prisons. So definitely not just a fiscal conservative. He’s conservative across the board. And STRONGLY so. Female readers of the Wintery Knight blog may now swoon. Where does Paul Ryan stand on foreign policy and social issues?